A single-file line of vehicles snakes through a narrow, winding road as the lush mountains behind them graze the hanging clouds. At the end of the procession, Volkswagens, Mustangs, Hondas and much more line up neatly in rows, one by one, in a huge grassy field still spongy from the overnight rain. Just beyond, a Ferris wheel and some dazzling blue steel track peek over a cluster of pine trees to see what all the engine revving is about. It’s the third annual Knoedown- a car show hosted by car enthusiast groups Counter Kultur and JunkStyles x Lowlifestyle, held this year on September 13th. 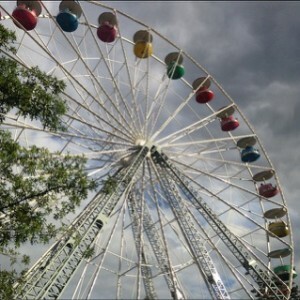 The show is located at Knoebels amusement park (pronounced “kuh-no-bulls”), the largest free-admission park in the country, nuzzled deep within a valley in Elysburg, Pennsylvania. Knoedown’s Facebook page promotes the event as “all breeds of vehicle are welcome and encouraged” to come out to the event, whose “sole purpose [is] having a great time with friends!” The welcomed diversity is evident in the quickly filling display zone, which takes up at least a quarter of the sprawling Knoebels parking area. Most license plates hail from Pennsylvania, though states are represented from across the mid-Atlantic region. Hundreds of cars of all types mingle within the rows- modern and vintage, pristine and well-worn, heavily modified and close to stock. Some are lowered so far to the ground that one questions how they made it through the field in one piece. 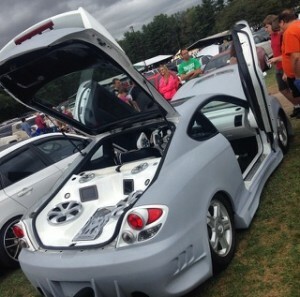 Hoods of muscle cars, pick-up trucks and tiny VW hatchbacks alike are propped open to show off their inner-workings. Spectators hold their faces inches from the motors, studying every detail like an art critic scrutinizing a watercolor. Some engines are purring as others growl, as the smell of burning oil mixes with that of wet grass. It’s the first day this year to submit to a fall chill, and though most of the trees on the mountains are still green, a few have impatiently begun to bronze. Show-goers range widely in age and style, from middle-aged men in cowboy boots to vaping, pink-haired teenagers, a large number joined by their dogs. Many visitors are families checking out an unexpected treat before hitting the rides. A crisp breeze has parents chasing kids to zip up their jackets as they wander excitedly from car to car. The vibe at Knoedown is upbeat and noticeably free of arrogance. Many praise this variety as their favorite part of the show, like John and Donna Mumie of Hazelton, PA. “The best part is that there’s so many different cars to see,” said Donna. 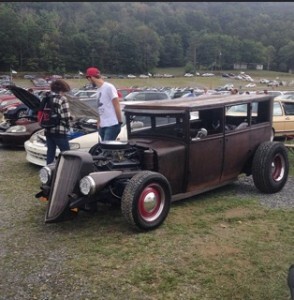 The couple is displaying three of their own, the most unique of which is their 1934 Essex Rat Rod. “Anything and everything is here. It’s very brand-friendly,” said Mary (who didn’t give a last name) of Mechanicsburg, PA enthusiastically. She, like many others here, is crouching low to the ground cleaning the wheels of her bright yellow Lexus IS-300. With all the excitement, it’s almost easy to forget the landmark at the end of the parking lot. Through the tall trees lies a park with an old-fashioned charm that’s becoming more rare with each year (it’s not common to see a 1913 carousel or French fries for $3 in a theme park, these days). Knoebels has been family-run for nearly 90 years, and boasts more than 60 rides, including two highly acclaimed wooden coasters and (new for 2015) a fast-paced, smooth-as-butter steel coaster called Impulse, which flips riders upside-down four times. The modern additions mesh well with the rustic, dated but charismatic atmosphere of the old park, which by mid-day is teeming with guests. “The show has definitely brought a large crowd for a Sunday in September,” said a woman with short brown hair, running the counter at one of the bustling gift shops. But, the event and its attendees bring no noticeable trouble to the quaint, folksy park. Nobody is racing (not that there’s room in the packed, earthy lot), and the police presence sometimes called for at car shows is absent. It appears that the show’s biggest imposition at Knoebels is the cheerful revving of engines echoing through the trees, and longer lines at the pay-per-ride coasters and award-winning food stands. The reasons for the show’s growing popularity are obvious. “There’s such a happy vibe,” said Jamie Orr, owner of Orchid Euro, a company specializing in finding “unusual” cars and parts, and shipping them all over the world (as he calls it, “the ‘American Pickers’ of European cars”). Orr is tall, tattooed and high-spirited. “It’s car people!” he said. “Everyone is friends, they want to talk! It’s like ‘Cheers’ here. You walk in, and everyone’s like, ‘Hey, Norm!” Orr pauses to calm his excited dog, who he found years ago as a puppy on the side of an interstate, forcing the large squad of cars he was leading to pull over with him. The ability of shows like this one to unite people from all over, he said, is hard to match.